Hatching is not easy. From the outside, it looks as if nothing is happening. Inside, a busy factory is at work making a baby albatross chick. What starts as a gooey mess transforms into bones and soft downy feathers. When chicks enter our light-filled world, they do so with a well developed muscle at the back of their heads and a special light-colored notch at the tip of their bill. Both aid in hatching. The muscle twitches, the head jerks up, and the scalpel-like notch, called an egg tooth, chips at the edges of the chick’s world until a pip, a hole, is made. The muscle keeps twitching. The egg tooth keeps chipping. The pip grows bigger until, hours that add up to a couple days later, the eggshell falls away. In a few months, the chick’s wings will grow to their full six-and-a-half-foot length, and the chicks will once again start pushing the edges of their—and our—known world. The hatching process reminds me of what Michelangelo reportedly said about carving his famous statue of David—that David was inside all along and he, the sculptor, just had to discover him. This is almost exactly what a pohaku (rock) shaper said to me the other week. The rocks tell him what they are. The poi pounder, say, was in the rock before he touched it. Just as the glorious white-and-chocolate-colored Laysan albatross with the airbrushed smudge below her eye was inside the egg all along. While life has been cooking along behind closed doors—or eggshells—it’s the big chick reveal that we tend to celebrate as the beginning of life. Those adorable fluffy chicks. I’m happy to report that in the month of January, thanks to a donation match by an anonymous albatross-adoring supporter, Albatography contributed to the next fun phase of albatross chicks: the gender reveal. 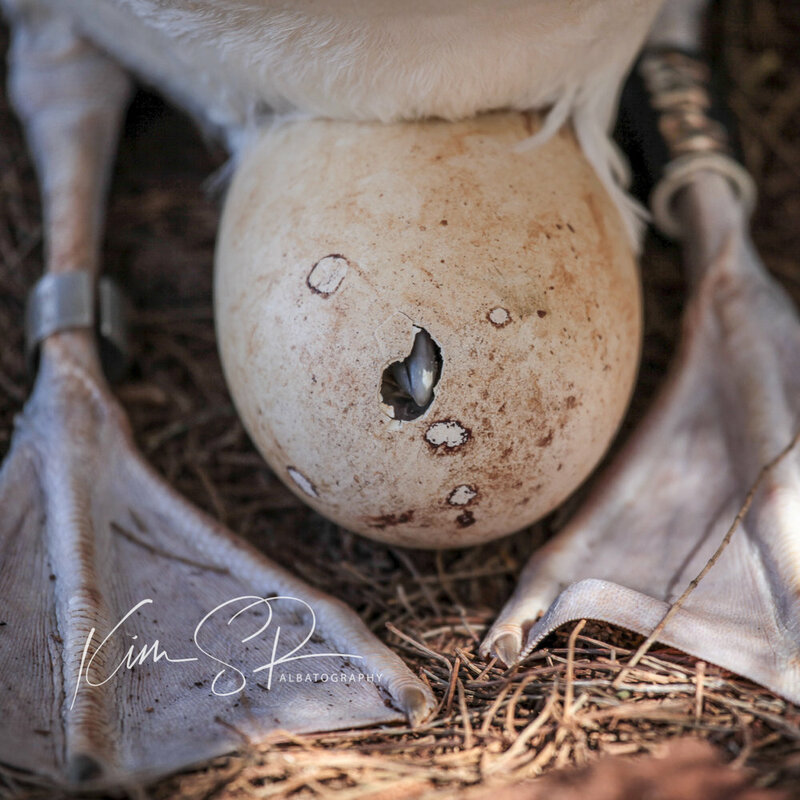 Thanks to your support of Albatography, Kauai Albatross Network will have the necessary funds to conduct DNA testing on the eggshells and linings of eight albatross chicks that will determine their gender. These aren’t just any chicks. These are chicks on the Cornell Lab of Ornithology’s #AlbatrossCam site. And that leads me to February’s #AlbatrossAmbassadoring recipient: the Cornell Lab of Ornithology’s #AlbatrossCam. Already, since going live on January 25th, we’ve witnessed three chicks hatch on the #AlbatrossCam. We’ve watched their first feedings. We’ve cheered as the moms returned to relieve the dads who must have been quite hungry—perhaps, even, hangry—after their weeks-long incubation duties. Thousands of people from around the world have tuned in to see these parents lay eyes on their downy chicks for the first time, to listen to their eh-eh-eh welcomes, and hear the chicks respond with their softer squeaks. All these natural processes of nature that we admirers of albatross call miracles. Some 99% of the Laysan albatross species nests in the Northwestern Hawaiian Islands, part of Papahanaumokuakea Marine National Monument. A few hundred—and growing—nest on Kauai, and thanks to the Cornell Lab of Ornithology, we are privileged to watch. Five years ago, before the #AlbatrossCam went live, only a handful of biologists, kama`aina, and cultural practitioners in Hawaii knew the intimate details of a Laysan albatross’ life history. Then, on January 27, 2014, a chick named Kaloakalua hatched on the #AlbatrossCam, and the awareness and knowledge of (Laysan) albatross around the world soared. And this will do (and already has done) wonders for albatross conservation. Thus, it feels so good to announce that 20% of February’s net proceeds will go to Cornell Lab of Ornithology’s #AlbatrossCam. Enter the magical world of mōlī; add albatography to your life!